January 1 is a very important holiday for the Republic of Cameroon because this day marks gaining independence from France. Independence Day in Cameroon is celebrated on January 1 since 1960. Earlier Cameroon was the territory administered by the German Empire. But during World War I the territory of Cameroon was occupied by French and British and divided into two parts as League of Nations mandate. First steps to gain independence from France and Britain were made in 1950s. Then the Union des Populations du Cameroun advocated its rights for independence, but France outlawed it. This pushed Cameroon political party to wage the war that ended only in 1971. Anyway since 1960 the territory of Cameroon administered by French became independent and was ruled by President Ahmadou Ahidjo. The Union des Populations du Cameroun officially changed its name to the Republic of Cameroun. The southern territory administered by British merged with the Republic of Cameroun only in 1961 to form the Federal Republic of Cameroon. In 1972 the country was again renamed the United Republic of Cameroon. 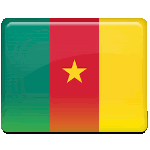 The last official name of the Republic of Cameroon was set in 1984.